Experienced. Four sizes. 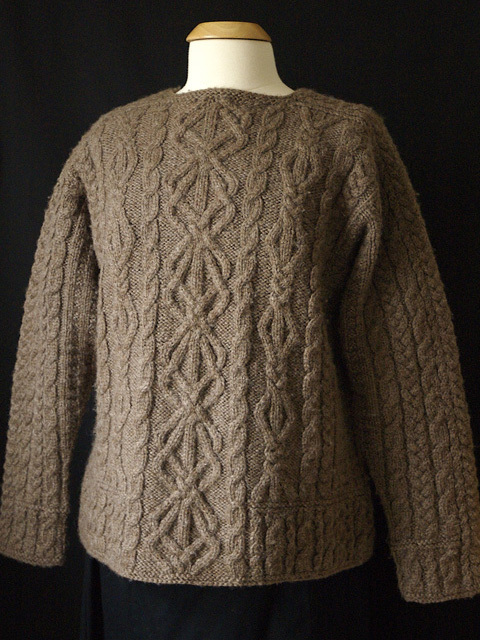 Celtic Dreams is an Aran pullover knitted from the top down, featuring saddle shoulders and square armholes, Aran motifs and a deep skirt (as the traditional Aran ribbing is called). The cuffs fit loosely in keeping with the early Arans. The saddle shoulders are worked first and the live stitches are put on holders. The front and back stitches are picked up along the edges of the saddles, and the neckline stitches are cast on. The front and back are worked downward to the armhole, where stitches are cast on for the underarm. The garment is then joined circularly, and worked to the bottom of the skirt. The sleeves are picked up along the armhole edges, and worked back and forth for a few inches, then worked circularly to the cuffs. The patterns were chosen so that all the motifs would repeat every 24 rows, even though some repeat more often. 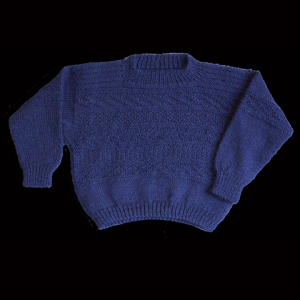 All the wrong side rows (alternate rounds) are worked as the stitches present themselves, to simplify the knitting. 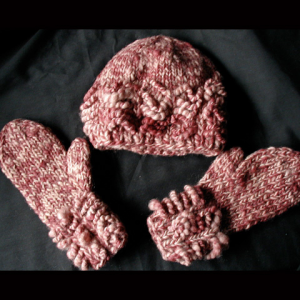 For experienced knitters. It can be made tunic length or shortened for a more conventional fit. Featured Techniques: Saddle shoulders, a longer length, and a discussion of avoiding cable splay. Gauge: 18 sts and 24 rows / 4″ (10 cm) in St st worked back and forth. 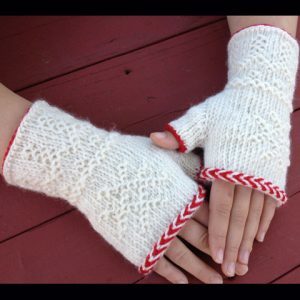 Yarn: Aran weight or heavy worsted weight yarn (100% wool), 1200 (1350, 1475, 1750) yards. Needles: Set of four double-pointed needles, 16″, and 32″ (40 and 80 cm) circular needles, size 7 (4.5 mm). Adjust needle size if necessary to obtain the correct gauge. Notions: Stitch markers, 3 stitch holders, cable needle, tapestry needle, waste yarn.